lace the seat cover over the back of the seat and pull down firmly, straightening the cover for a tight snug fit. Push the centre straps through between the seat base and backrest so they can be tied underneath the seat. Pull the base cover over the base of the seat and straighten to ensure a neat, snug fit. Run the straps on the outside of the seat cover base and tuck in behind the plastic side cover of the seat and bring it under the seat just above the seat rail. The seat cover is held in place by the straps. Fasten all straps to each other or to the underside of the seat. Remove the headrest from the seat completely. Some headrests have a button located under the headrest. Push the button in and pull the headrest upwards to remove it. 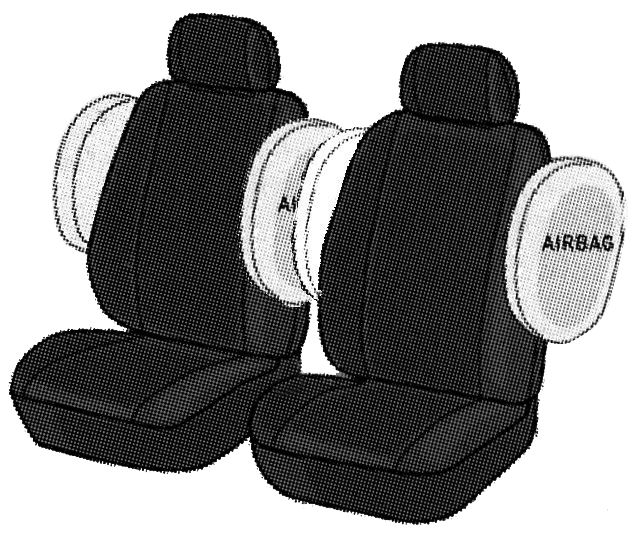 Other vehicles will have a pin that needs to be pushed out to allow the headrest to be removed. Fit the headrest cover over the headrest and fasten the velcro straps together. Do not refit the headrest to the seat just yet, keep on the side. Place the seat cover over the back of the seat and pull down firmly, straightening the cover for a tight snug fit. Push the centre straps through between the seat base and backrest so they can be tied underneath the seat. Where there is carpet on the back of the seat restricting access through the seat, push the ties through the corner of the seat back and base. Once the seat cover is fitted correctly, refit the headrest to the seat and push down so that the headrest retracts to its original position. Correct initial fitting and securing of Deploy Safe seat cover on the vehicle is essential to guarantee the safety of the user. Seat covers have Deploy Safe seams on both left and right hand side of each seat cover to permit fitting on either front seat. Driver and passenger seats must be mounted in the correct positions. Seat covers that have slipped must be repositioned. If this is no longer possible because of advanced wear the cover must be removed and replaced. Do not tamper with the opening side seam of the seat cover. If the side seam splits for any reason it CANNOT be repaired. Any attempt to re-sew the seam may interfere with the integrated side airbag deployment. Airbag deployment must never be compromised by the incorrect fitting of car seat covers. Deploy Safe Seat covers are designed to allow the side seams to split open upon deployment of an airbag as they are constructed using a computer controlled stitching process and a specialised thread. Deploy Safe seat covers are suitable for vehicles with or without integrated side airbags. WARNING: Do not fit seat covers without side airbag allowance to seats with integrated side airbags.